Coincidentally all hosts won their games. Here is the last day review presented by ESL. Fourth-ranked Lakers (12-20) made lots of trouble for first ranked Magic (18-11) in Lakeland on Monday. Magic managed to secure only two-point victory 108-106. However their fans expected easier game. Magic looked well-organized offensively handing out 28 assists. The best player for the winners was forward Amile Jefferson (206-93, college: Duke) who had a double-double by scoring 22 points, 14 rebounds and 7 assists (on 11-of-14 shooting from the field). Swingman Anthony Brown (199-92, college: Stanford) chipped in 13 points and 10 rebounds. At the other side the best for losing team was guard Andre Ingram (191-85, college: American, agency: 011 Sports) who recorded 27 points. Both coaches used bench players in such tough game. Magic maintains first position with 18-11 record. Lakers at the other side keep the fourth place with 20 games lost. An exciting game was played in Mississauga. Second ranked Raptors 905 faced one of their biggest challengers Knicks. Host Raptors 905 (19-11) defeated guests from Westchester (18-16) 106-91. It was a good game for Canadian-Saint Lucian power forward Chris Boucher (208-93, college: Oregon) who led his team to a victory with 25 points and 5 rebounds. Jordan Loyd contributed with 10 points and 15 assists for the winners. point guard Sekou Wiggs (193-94, college: Alaska-Anch.) replied with 22 points and 5 rebounds for Knicks. Both coaches tested many bench players which allowed the starters a little rest for the next games. Defending champion maintains second position with 19-11 record having just five point less than leader Santa Cruz W., which they share with Stockton K. Knicks lost third consecutive game. They keep the third place with 16 games lost. An exciting game was played in Oklahoma City. First ranked OKC Blue faced second-best Salt Lake City Stars. Host OKC Blue (23-9) defeated guests from Salt Lake City (15-15) 117-110. Deonte Burton scored 24 points and 6 assists to lead the charge for the winners. OKC Blue's coach used an eleven-player rotation and allowed the starting five to rest. The best for the losing side was Nazareth Mitrou-Long with 20 points, 7 rebounds and 7 assists. OKC Blue maintains first position with 23-9 record. Loser Salt Lake City Stars keep the second place with 15 games lost. An exciting game was played in Hidalgo. First ranked Rio Grande Valley Vipers faced second-best Sioux Falls Skyforce. Host Rio Grande Valley Vipers (22-10) defeated guests from Sioux Falls (22-11) 141-133. It ended at the same time the five-game winning streak of Sioux Falls Skyforce. It was a key game for the top position in the league. Michael Frazier notched 43 points (!!!) and 4 assists to lead the effort. Rio Grande Valley Vipers have an impressive seven-game winning streak. They maintain first position with 22-10 record. Sioux Falls Skyforce at the other side keeps the second place with 11 games lost. An exciting game was played in Mississauga. 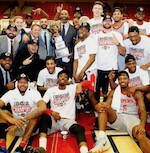 Second ranked Raptors 905 faced one of their biggest challengers Knicks. Host Raptors 905 (19-11) defeated guests from Westchester (18-16) 106-91. Raptors 905 players were unselfish on offense dishing 28 assists. 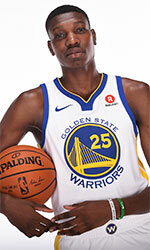 It was a good game for Canadian-Saint Lucian power forward Chris Boucher (208-93, college: Oregon) who led his team to a victory with 25 points and 5 rebounds. Guard Jordan Loyd (193-93, college: Indianapolis) contributed with a double-double by scoring 10 points and 15 assists for the winners. Point guard Sekou Wiggs (193-94, college: Alaska-Anch.) replied with 22 points and 5 rebounds and swingman Zack Irvin (198-94, college: Michigan) added 10 points and 9 rebounds in the effort for Knicks. Both coaches tested many bench players which allowed the starters a little rest for the next games. Defending champion maintains second position with 19-11 record having just five point less than leader Santa Cruz W., which they share with Stockton K. Knicks lost third consecutive game. They keep the third place with 16 games lost. Fourth-ranked Lakers (12-20) made lots of trouble for first ranked Magic (18-11) in Lakeland on Monday. Magic managed to secure only two-point victory 108-106. However their fans expected easier game. Magic looked well-organized offensively handing out 28 assists. The best player for the winners was forward Amile Jefferson (206-93, college: Duke) who had a double-double by scoring 22 points, 14 rebounds and 7 assists (on 11-of-14 shooting from the field). Swingman Anthony Brown (199-92, college: Stanford) chipped in a double-double by scoring 13 points and 10 rebounds. At the other side the best for losing team was guard Andre Ingram (191-85, college: American, agency: 011 Sports) who recorded 27 points and guard Alex Caruso (196-94, college: Texas A&M) added 12 points, 5 rebounds and 12 assists respectively. Five Magic and four Lakers players scored in double figures. Both coaches used bench players in such tough game. Magic maintains first position with 18-11 record. Lakers at the other side keep the fourth place with 20 games lost. An exciting game was played in Oklahoma City. First ranked OKC Blue faced second-best Salt Lake City Stars. Host OKC Blue (23-9) defeated guests from Salt Lake City (15-15) 117-110. OKC Blue forced 26 Salt Lake City Stars turnovers. Strangely Salt Lake City Stars outrebounded OKC Blue 36-23 including 30 on the defensive glass. They looked well-organized offensively handing out 29 assists. Swingman Deonte Burton (193-94, college: Iowa St.) scored 24 points and 6 assists to lead the charge for the winners and guard Bryce Alford (190-94, college: UCLA) chipped in 23 points during the contest. OKC Blue's coach used an eleven-player rotation and allowed the starting five to rest. The best for the losing side was Greek-Canadian guard Nazareth Mitrou-Long (193-93, college: Iowa St.) with 20 points, 7 rebounds and 7 assists and forward Tyler Cavanaugh (206-94, college: G.Washington) scored 26 points and 5 rebounds. Four OKC Blue and five Salt Lake City Stars players scored in double figures. OKC Blue maintains first position with 23-9 record. Loser Salt Lake City Stars keep the second place with 15 games lost. An exciting game was played in Hidalgo. First ranked Rio Grande Valley Vipers faced second-best Sioux Falls Skyforce. Host Rio Grande Valley Vipers (22-10) defeated guests from Sioux Falls (22-11) 141-133. It ended at the same time the five-game winning streak of Sioux Falls Skyforce. It was a key game for the top position in the league. Rio Grande Valley Vipers made 24-of-29 charity shots (82.8 percent) during the game. They also forced 21 Sioux Falls Skyforce turnovers. Rio Grande Valley Vipers players were unselfish on offense dishing 31 assists. 24 personal fouls committed by Sioux Falls Skyforce helped opponents get some easy free throw opportunities. Guard Michael Frazier (193-94, college: Florida) notched 43 points (!!!) and 4 assists to lead the effort and German power forward Isaiah Hartenstein (211-98) supported him with 18 points, 15 rebounds and 6 assists. Even a double-double of 24 points, 5 rebounds and 12 assists by Burkinabe-American guard Bubu Palo (185-91, college: Iowa St.) did not help to save the game for Sioux Falls Skyforce. Forward Raphiael Putney (207-90, college: Massachusetts) added 27 points, 10 rebounds and 4 blocks. Both teams had five players each who scored in double figures. Rio Grande Valley Vipers have an impressive seven-game winning streak. They maintain first position with 22-10 record. Sioux Falls Skyforce at the other side keeps the second place with 11 games lost.